Yesterday I watched basketball and wrote some more about The Basketball Kid. I don’t know if I really got anywhere with the writing, but at least I decided on a name of the town where The Basketball Kid lives his eternal teenage moment: Hartland. I named the town after the tiny block-long street I live on at the moment, Hartland Court. The imaginary Hartland differs considerably from the real Hartland. The real Hartland is a malodorous diorama of modern urban life, an abandoned 20th century warehouse at one end, a rotting 19th century house at the other, and in between those two buildings a discordant mixture of the following: a couple lopsided, dilapidated two-story houses, some flimsy brand-new condos with brick fronts and aluminum-siding sides and backs, one low, ugly brick and cinder-block apartment building, and one vacant lot overgrown with spiny, trash-clogged, rat-friendly brush. White people live in the condos, black people live in the apartment building, one large Hispanic family occupies one of the dilapidated, lopsided houses, cheerful Korean girls studying to be doctors and lawyers live in the first floor apartment in the other dilapidated house, and my wife and I live above them in the second floor apartment. The roof leaks in several places, and the walls are crumbling, and the floor is so slanted I feel like we’re in a bad guy’s hideout in the old Batman television show, and there’s an everpresent possibility that the whole place might just keel over at any second. We will be leaving the place soon; it’s being converted into another flimsy yuppie-trap of a condo. This last detail, that we’re moving away from Hartland just a year after we moved to Hartland, is the one I’d highlight if I was asked to name the single defining aspect of the real Hartland as opposed to the imaginary Hartland of The Basketball Kid. People come and go all the time on the real Hartland. In the short time we’ve been here, our first downstairs neighbor moved out (amid screaming matches with the landlord, which seem often to be part of the soundtrack of transience), replaced by the Korean girls, the building we live in has been sold, a “for sale” sign has appeared outside the Hispanic family’s house across the street, the vacant building next to their house has been demolished, and the vacant lot next to the site of the demolishing has been transformed by Ukrainian construction workers into another generic condo that looks as if it could collapse in a stiff wind, meaning it’s perfect for the real Hartland, where nothing lasts. But in the imaginary Hartland, home of The Basketball Kid, everything and everyone stays the same. Houses belong to families of people who were born in Hartland, who grew up in Hartland, and (though this seems not to be something the eternal Basketball Kid has to worry about) who, when the time comes, die peacefully and surrounded by all their loved ones in Hartland. Clearly there are similarities between my imaginary Hartland and other imaginary towns. Jack Berrill’s Milford comes to mind, as does Rod Serling’s Willoughby, as well as Riverdale (the hometown of “America’s typical teenager”), and John Cougar Mellencamp’s “Small Town,” which is used to greatest effect on this rousing YouTube clip as the backdrop for the heroics of a man who appears to be a mulleted emissary dispatched from the very center of white America’s deepest Hartland dreams. Of course the hero of the YouTube clip is not from imaginary Hartland, but from French Lick, Indiana, a town often presented in hagiographic sportspage offerings as being a real-life version of the popular myth of the Hartlandesque small town. This painting of actual towns as “Hartlands” is common. Many of us seem to be looking for Hartland. Sometimes this search results in fictional versions, and sometimes this search results in the willful softening of reality. 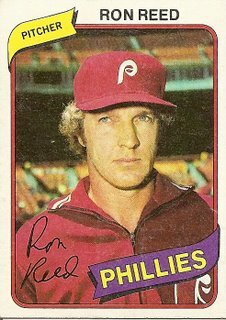 Indiana, home state of Larry Bird, John Cougar Mellancamp, and the man pictured in the 1980 baseball card at the top of the page, Ron Reed, seems to be something of a nexus for this popular style of American dreaming. Ron Reed was born in LaPorte, Indiana, a town recently featured in a book of found photographs that seems to speaks directly to the American quest for Hartland. The book, LaPorte, Indiana, presents a series of black and white portraits taken by long-time LaPorte studio photographer Frank Pease, displaying not only (as John Mellencamp blurbs on the book’s website) “real people . . . [whose] grace and dignity . . . should be a source of hope for us all” but also a kind of nostalgic, idealized American dreamland: The subjects of the pictures seemingly inhabit a town where The Basketball Kid himself might feel very much at home. This makes sense in terms of the man pictured here, Ron Reed, who may just be the Cardboard God who comes closest to being, or at least having once been, the sunny, mythic figure that is The Basketball Kid. Reed was an athletic superstar in high school in LaPorte, earning a basketball scholarship to nearby Notre Dame, where he was good enough to be selected, in 2004, to the university’s All-Century Men’s Basketball Team. He played professional basketball for two years, averaging 9.4 points and 6.4 rebounds per game for the Detroit Pistons, then switched to baseball, where he had a productive 19-year career that included selection to an all-star team, a World Series championship, and the tying of the modern-day record for fewest home runs allowed in a season (250 innings or more). Wanting to find the reason for this mistake, I checked to see if the pitcher Reed tied was Al Downing, but Al Downing never allowed that few a number of home runs in that amount of innings. Al Downing did allow the most famous home run of all time, Hank Aaron’s 715th, in a game, ironically enough, won by Ron Reed. Perhaps that thin connective tangle of Reed and Downing and home runs and records led to the mistake on the part of the artist. Mistakes like this happen all the time here outside the town limits of Hartland. In the photo on this card, Ron Reed seems to have come to understand this. He is certainly not someone who gives in easily to mistakes, as both his stern, unwavering gaze and his pride in his record for fewest home runs (which really is a record for fewest mistakes) attest. But life in the big leagues, life in a world of mistakes and transience, has wiped from Ron Reed’s countenance what I imagine to have once been something very much like the bright, friendly smile of Hartland’s favorite son, The Basketball Kid. If I lived in Hartland, my job would be writing those cartoon panels and beneath-the-stat blurbs over at the Topps factory. Would it be great if there were Topps-esque “beneath-the-stat” blurbs for all professions? What resume or CV wouldn’t be instantly sexier with a cartoon indicating that “Fer led all western Tennessee librarians in book jerking for two consecutive years!”, with cartoon me holding up two fingers? Peace, baby! Even better would be if I were drawn as cartoon Oscar Gamble, so my work helmet would teeter improbably on top of my enormous and work-inappropriate hairdo, but one dream at a time. 2. Shouldn’t the imaginary mistaken headline read “DOWNING ALLOWS” homer though? Or are my eyes not that good anymore?